The quick attach/detach lever is a big plus in my book. The PL-1 II Valkyrie is the upgraded heavy-duty version of the original PL-1. The weapon light uses (1) CR123A battery for power up to a maximum 450 lumens of output. Light is produced using a single LED bulb designed with the latest high-output light technology. Changing batteries is accomplished by simply unscrewing the flashlight head to access the battery compartment. This can be accomplished with hand torque, and does not require tools or a special insertion procedure to return the light to ready status. The Valkyrie PL-1 IIcomes with a mount for a MIL-STD-1913 Picatinny, or Glock sized rail, with a compact tool included for easy mounting or change outs. One of the very positive features is the new heavy-duty quick attach and release mounting system. This allows the user to quickly mount or dismount the Valkyrie PL-1 II for desired use, or battery changes. This is particularly important for police work, when making a quick change on a call does not provide an officer time to use a tool. Ambidextrous textured controls make using the Valkyrie easier. Olight simplified the PL-1 operation making the light more natural and practical to use in high stress situations. This includes ambidextrous rear push-button controls that are textured for fast tactile reference and positive finger control. Activation can be accomplished with a full forward push of the control, or simply tapping the side of the control. This makes use in high stress situations much more sure and confident. The light as a series of vent slots on the top of the housing over the bulb, ensuring that excess heat can disperse and not stay focused on the light body itself. 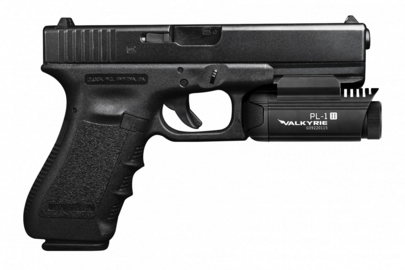 Though specifically shown with use for Glock pistols, the Valkyrie PL-1 II weapon light will fit any standard Picatinny rail making this weapon light a viable option for many modern pistols, rifles or shotguns. Made of high quality materials, and at a price in the middle of the market, the Valkyrie PL-1 II has a lot of potential. All Olight products meet ANSI/NEMA FL1-2009 standards. Heat vents will help keep the powerful Valkyrie from getting too hot. The BlueSheepDog Crew have not had the opportunity to test the Valkyrie PL-1 II or any other Olight products. We have heard and read some positive reviews on their products, but only offer this as a weapon light with potential. The 450 lumens is starting to reach our maximum limit for ordinary light work (which is 500 lumens), due to the potential of blinding flash back. This higher output also drains the single battery quicker than say the (2) CR123A batteries offering a 300 lumen output for 2.5 hours on the very popular original Streamlight TLR-1. The size of the Valkyrie appears it would be capable of being compatible with light-mounted holsters designed for theStreamlight TLR-1. The Valkyrie is slightly smaller in length and width than the TLR-1 at 3.39 inches long and 1.44 inches wide. Proper fitting may or may not be compatible and readers are cautioned to experiment or obtain Olight’s recommendations before purchase.